Check out the posting board installation on the main floor of PH! BathHouse this Semester was in many ways, enjoyable, cohesive, and productive. First I would like to praise the specifics of its organization, I will say that the requirement of all Creative Writing (CW) students to attend is a smart and generous move of the CW faculty. Otherwise, unfortunately, half of the Sponberg Theater would be empty and the visiting authors would feel unappreciated. Also, Sponberg Theater is a good is good location being that it is near the center of EMU’s Campus and thus makes the walk about even for everybody. Additionally, the timing of the events were as good as they could have been at a college full of commuters Eastern. Since anything scheduled before 4pm is likely to interrupt with classes, it made sense to have the readings start around 5 or 6:30pm. And, of course, since many commuters come from an hour or more away, it was helpful to have the reading on a day when they were already on campus. To broaden my review, the planning and programming of these events provided EMU students with a cohesive experience. Most obviously, Taylor Brady’s work was taught in at least some of the CW classes this semester, precisely to prepare for Taylor’s live presence at the BathHouse readings. Hearing an author live can make all the difference, especially for younger poets who are always in the hunt for mentors and real, available brains to pick for opinions. The Reading with Jill Darling, Sara Williams, and Laura Wetherington benefited CW students in that many students were already invested in them as their former or current teachers. Pathos really does make a difference in how we see a person’s work. That is not to say that their work was not so good without the pathos. It is only to say that the students are more likely to lend a generous ear to people who have been generous to them. I should also mention that Jill and Laura’s plan to read a collaborative poem was another good example of community. I wonder now whether they were reading their own lines or whether they read each other’s lines or some mixture of the two. Both of these readings stand as good models for community in literature. In regards to the actual poets and poems, I am somewhat ignorant. I was not one of the students who studied the poems that Taylor Brady read in class, and I have never had a class with any of the EMU MA’s, so I was partially out of the loop. I know now that Taylor Brady’s poetry is the kind of poetry that needs to be read ahead of time, but I didn’t know then, so I did my best to catch a glimpse of what was being said. This is one suggestion I have for future readings. If the poet writes short and/or dense poems, I would put as many poems as possible online for students to study beforehand. Another suggestion I have is in regards to the interests of the EMU CW community and to the larger EMU community. As with all Universities, EMU’s Creative Writing program has a distinctive flavor. In my experience it tends to be more experimental than other communities I’ve been around. That said, my professors accommodate different tastes to a reasonable extent in their classes. I would like to see this happen more with the reader series. Personally, I like experimental work, but I also like the poets who are more conversational and highly emotional (not sentimental of course). If we were to bring in poets like this, on an occasional basis, I believe that more non-CW students would come to readings and that CW students would get a new take on the possibilities of contemporary poetry. Take this suggestion with a grain of salt because I’ve only been at EMU since last Fall. Even though I have said that EMU tends to be experimental, I will also say that it is very practical, in that, when you’re handing in a final draft, your work is your work. The teacher just wants to know that you are working hard and that you’re going through the process of learning what he or she is teaching you. I think this has been beneficial for me because I’m not great at all forms of writing. I try them out, but if I feel strongly led to something familiar, I don’t always hold back. After just reading Snow Sensitive Skin, featuring work from both Taylor Brady and Rob Halpern, I was very excited to attend this BathHouse event. Taylor Brady was welcomed by Rob Halpern in a very heartfelt letter of appreciation and praise. It was enjoyable listening to Rob talk about Taylor’s accomplishments as a writer, and how he has inspired new thoughts and writings. What I loved most about Taylor Brady’s work was that it dealt with a topic that is relatable to most people: debt. Not only was this topic relatable, but it’s not often a topic that I ever come across when reading poetry or prose. I enjoyed the fact that Taylor’s work was much different from other poetry that I read, and even my own poetry. To be honest, I don’t think I would ever include debt as a possible topic to write about. However, Taylor presented it in a lovely way throughout his poetry. I also loved the physicality of Taylor’s work. Many words and sounds stuck with me because they seemed to be very physical words. His words were not only powerful, but they were doing something in the text. As a writer, it is often difficult to attain that level of physicality within a piece, but I think Brady’s work is a great example. 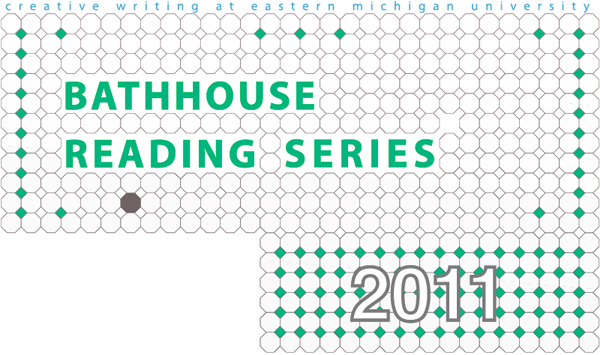 The BathHouse Reading Series is not only about shifting our perspectives, but redefining them. Tonight we welcome a writer whose work is all about redefining perspectives, not only with respect to the micro-politics of daily life, but also within the scope of narrative and literature itself. Taylor Brady lives in the San Francisco Bay area and is the author of many acclaimed works including Microclimates, Yesterday’s News, and Occupational Treatment, as well Snow Sensitive Skin, a collaboration with our own Professor Rob Halpern. Brady’s writing resists our efforts to know it; this is no accident, but a deliberate, ethical decision. Brady refers to narrative as “…the elaboration of an ongoing experience of missing the point.” Encountering his work is like encountering another human being when we stumble into those lucky, horrifying moments of social amnesia and forget categories and conventions, like staring into a prism of infinite complexity. And we are at a loss for description, as to grant privileged attention to one colored refraction is to do violence to the rest. Or maybe it’s more like some hyper-paced plate-tectonics, confounding every would-be Magellan by shifting territory faster than the hand that presumes to draw the map. We feel lost in Brady’s prose and verse; it is a bucking bronco that wants to throw you, a determined resolve that shapes and intensifies its kicks and whips and thrashing in direct response to your efforts to hang on. We might be inclined to resent him for this. What I mean is, at first I was inclined to resent him for this. I felt as though I had to leave a trail of bread crumbs behind me just to find a way out of his sentences. But then I realized his work was drawing attention to the very content of my efforts to keep up, my desperate and frustrated need to extract and isolate meaning from these words and images. I found myself wondering just from where I was getting all these meaning-seeking bread crumbs, just how it is I had pockets full of them. I began to find that these crumbs weren’t arbitrary or shapeless at all. They had character and inclinations and attitudes, and a sort of spooky unspeakable context the way dreams have. But they weren’t dreams at all; rather, they were like wrinkles in the fabric between myself and my waking reality, a fabric which usually hangs as a veil, too sheer and familiar to notice. I began to see his sentences, and my memories, and thoughts, and sense-making efforts as though set up in some third place like a rec center basement or high ceiling garage, with each of these elements embodied and sitting in a circle on gray metal folding chairs sharing some telepathic conversation in words made out of dream-context anti-words. And because no one is really talking, everyone speaks at once, if without conclusion, than certainly not without consequence. I imagined the work as a kind of four dimensional map of our social relations, which, as tangled and dynamic as they may be, here are teased and felt and thoroughly investigated in something of a web of associations or a melting collaborative landscape. And that it was this landscape that is our social reality; that we carry this rec center basement collective around with us, every moment of every day. Sharing in this landscape, ladies and gentlemen, please welcome Taylor Brady. BathHouse Reading: Taylor Brady – Thurs, Nov.10, 6:30 p.m. The next BathHouse Reading is just around the corner. Don’t miss a Reading by San Francisco author Taylor Brady, taking place Thursday, November 10, 6:30 p.m. – 8:00 p.m. at the Sponberg Theatre on EMU’s campus. Taylor Brady is the author of Microclimates (Krupskaya, 2001), Yesterday’s News (Factory School, 2005) and Occupational Treatment (Atelos, 2006). He is co-author with Rob Halpern of Snow Sensitive Skin (2nd edition published this year by Displaced Press.) His recent work from a book-length project, In the Red, is collected in a chapbook, For I Know Not What I Did Last Summer (Trafficker Press). A second book-length project, “Maps, Jokes and Heavy Armor,” has appeared in segments in various small magazines. Taylor is the editor of a volume of collected essays by Los Angeles poet Will Alexander, Singing in Magnetic Hoofbeat. He lives in the San Francisco Bay Area.